Arecibo Scarf Perfect For Keeping Warm / Making First Contact | OhGizmo! 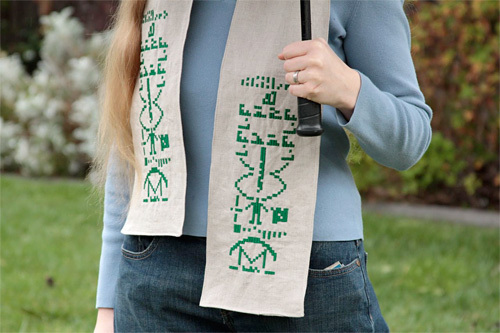 Whether you’re braving a winter storm, or serving as humanity’s first ambassador to extraterrestrial life, this simple scarf embroidered with the Arecibo message is sure to come in handy. You’ll have to make it yourself, but thankfully the rudimentary pixel design of the message that makes it easy for ET to understand should also make it easy for embroidery novices. And you can download the pattern from Evil Mad Scientist Laboratories for free. Yea I have a policy against wearing things that have foreign languages on it that I can't read. I don't like wearing something that could say, I'm dumb or offensive.